Did you realize that last year there were an estimated 5,000+ new tabletop games released? More than 5,000 games. The bulk of those debut at a game convention or in preparation for the holidays, but let me break it down by day to help put into perspective exactly how many that is. You could play 13 new games every day in 2017 and still not get through all the new releases. Some are additions to an existing publisher’s catalog while others are from designers who are bringing their dreams to reality. When we attend conventions such as Gen Con or Origins Game Fair, we’re able to meet companies that are new to the industry or moving from publishing independently to releasing on a larger scale. 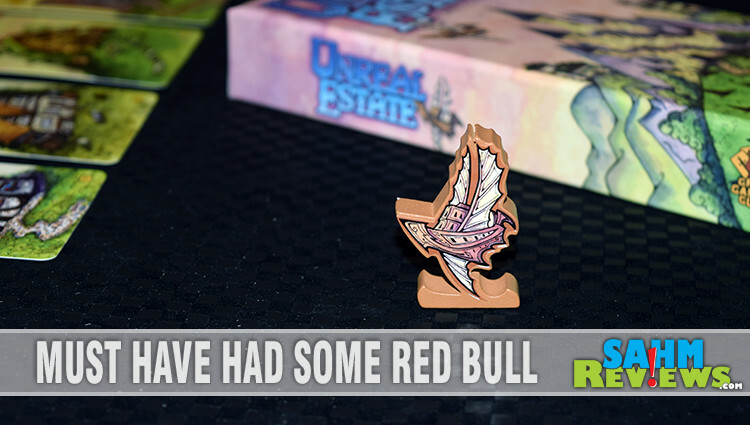 Last year, we connected with Grand Gamers Guild and were able to check out a couple of their titles – Stroop and Unreal Estate. These may have been their first titles, but they certainly aren’t their last! Have I mentioned lately that games of speed aren’t my strong suit? I don’t do well at them, but that doesn’t mean I don’t enjoy playing. What I’ve come to realize is that these types of games help me strengthen where I’m weak. In the same way that I get better at crossword puzzles or cryptoquotes by working on them daily, I get better at recognition and reaction when I’m regularly playing games that make me think quickly. Have you ever seen those puzzles where you are tasked with saying the color you see, but the image being displayed is actually a different word written out. Like this: “Red” and “Yellow“. That’s the entire concept behind Stroop. 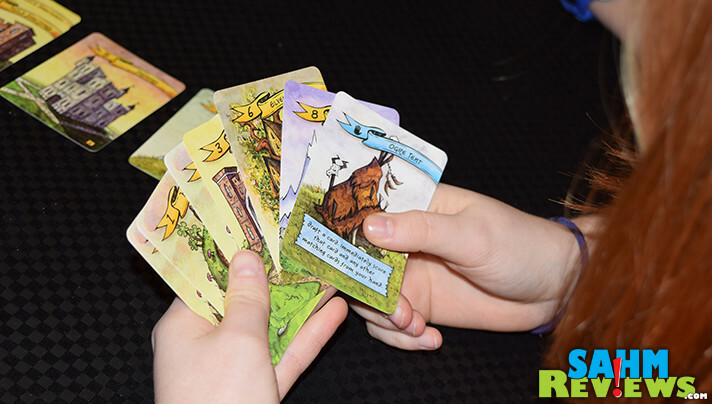 Each player is given 15 cards that form their own personal deck. Excess cards are set aside. The goal is to be the first to get rid of their personal deck. Easy, right? No. 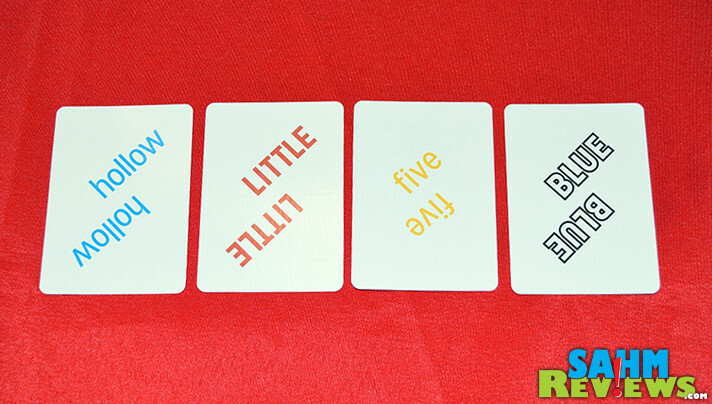 Cards display a color, size, pattern and number of letters. Colors include blue, red, black and yellow. Size is big or little. Pattern is hollow or solid. Number of letters are three, four, five and six. 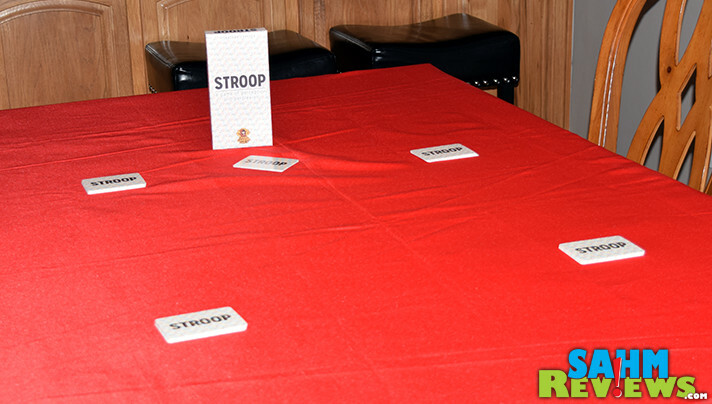 If you thought that red/blue puzzle challenge was tough, you’re in for a doozy with Stroop! Play takes place over two rounds. All players will be taking actions at the same time so speed and accuracy are important. You draw cards from your deck one at a time into your hand. There isn’t a hand limit so don’t worry about that, but the key is you can only draw one at a time while simultaneously trying to match the ever-changing card in the center of the table. 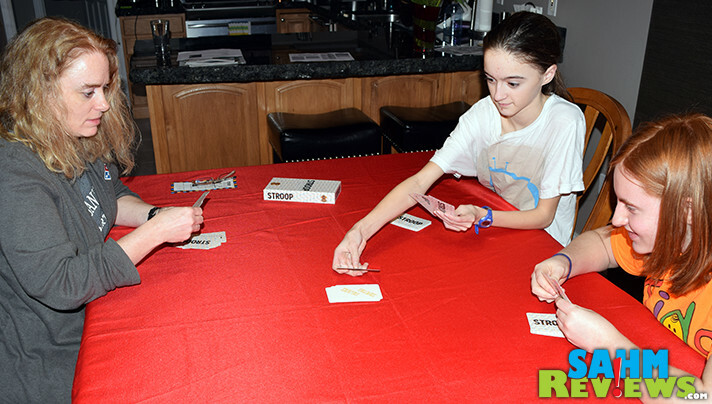 In the first round, a card from the excess stack is placed in the center of the table within reach of all players. If the card in the center says “Blue” then you can play any card from your hand that is the color blue. Not one that says blue. One that IS blue. If it says “little” it needs to have small print. And so on. Not only is your brain trying to process which card fulfills the requirement, but you’re racing to beat your opponents to it. Once they place something, it will change the requirement! The process continues until someone has picked up the last card in their deck but doesn’t have a playable card. If it’s valid, then the stack in the middle is shuffled and evenly distributed to all players to be combined with the balance of their round one deck. Just when you wrap your brain around which cards to discard, the second round comes along and changes gears. In this round, you’ll be placing a card that explains the card in the middle. The exact opposite of what you were doing in round one! 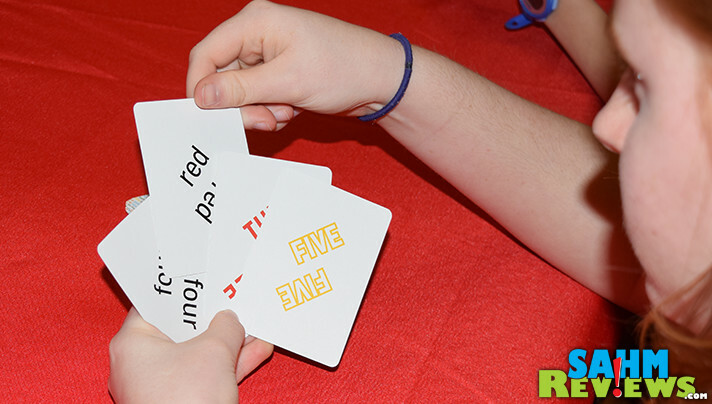 A hollow lettered, capitalized card spelling out the word red would mean you’re able to discard a card with red letters, the word big, the number three or the word hollow. Yeah, it makes my head hurt just typing that. Imagine trying to play it! Never mind, don’t imagine it… just try it! You can pick up a copy of Stroop on Amazon for around $16. I have a special fondness for anything relating to construction because it reminds me of my dad. Unreal Estate refers to proposals and building, two common construction terms that transport me back to my days in the industry. However, how they play into this game is far from anything normal. The base scoring mechanism is a multiplier, but includes a unique twist on future scoring options. 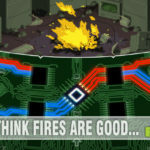 The game itself is compact yet filled with the need for strategic thinking. 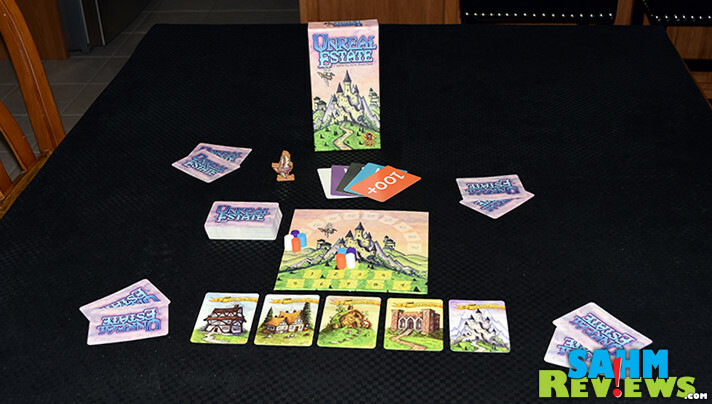 Unreal Estate includes two types of cards. Building Cards and Special Building Cards. The only difference is that the special ones have an added ability. 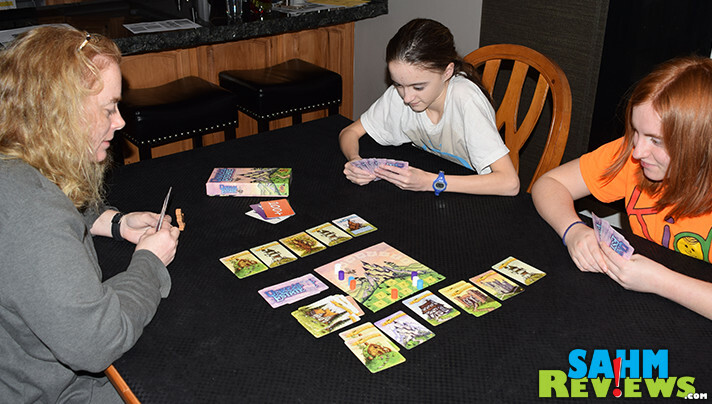 Each player is given a hand of two building cards then additional building cards are added to a Scrap Pile based on the number of players. Six randomly selected Special Building Cards are combined with the remainder of the building cards then placed in a Draw Deck. Five cards are placed in a row to form a Proposal Board. The goal is to have the most points when the stack of building cards is depleted. On your turn, you must take one of three actions. (1) Draft a card from the Proposal Board, (2) Play a Special Building card to earn its effect or (3) Play Building Cards to score. Note that some Special Building Cards take effect when drawn, others when drafted and others later during the game. If you want to play building cards from your hand (you do, that’s how you score), that plan needs to be visible in the scrap pile. If it is, you’ll play all the cards in your hand that match that plan and score accordingly. The value of the building times the number of cards in your hand are the base of your score then it’s multiplied by the number of that building in the scrap pile. Here’s where things get interesting. Once you’ve completed scoring that building, you place all the ones from your hand AND the scrap pile into the discard pile. That’s what makes this unique. Any other player who is sitting with that type of card in their hand needs to wait until another lands in the scrap pile. Which brings me to the next step. After each player takes a turn, all the regular building cards remaining in the Proposal Board move to the Scrap Pile and five new ones are dealt to form a new Proposal Board. The first player token rotates to the left and the process begins again. 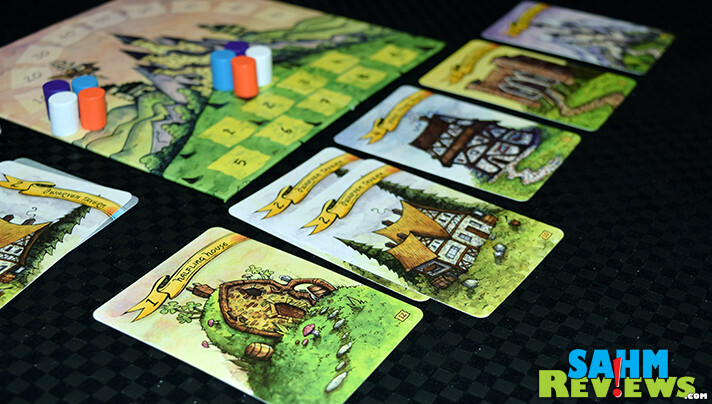 When a round begins with no cards in the Draw Pile to seed the Proposal Board, each player is given one more turn to build and score. The player with the most points wins. The game itself isn’t complicated to figure out and can be played by young kids. You can pick up a copy of Unreal Estate on Amazon for under $11! Also available direct from the Grand Gamers Guild website in addition to Amazon, both Stroop and Unreal Estate can accommodate 2-5 players and each only last about 15 minutes. The compact size makes them great for travel and they don’t take up much room on the game shelf. 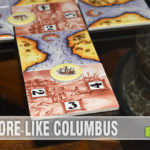 There are more releases coming from Grand Gamers Guild including their Endeavor: Age of Sails Kickstarter which runs through March 1st. What to know what else they’re up to? Follow them on Twitter and Facebook to hear more. 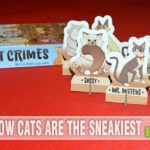 Which of these games will be the first to make it to your game table? 5000+ tabletop games last year? Wow! I had no idea it was that many! We are a big gaming family. I have to check out some these to see what my boys would like to try! I had no idea that many tabletop games are released in a year! That’s a lot! These games look like fun. I too enjoy games where strategy is involved. Wow for all those new board games released in 2017! I can only imagine how fun it must be to attend one of those conventions! My family enjoys board games on occasion also. I’m no good when constrained by time either but at the same time I don’t enjoy games that seem infinite. Woah, I need to get more board games! I was not aware there are so many out there. 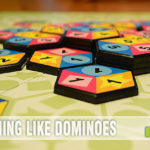 We are just getting to the point that my kids can play along with games without getting upset so it is starting to become a fun family activity for us. OMG! How many tabletop games were released last year? I could probably name 5 at best. I can’t imagine there being many more!! We love board games like this! Thank you for letting us know about it!